Pgh Momtourage: Like it for a love it price! The Tea Collection currently has an ongoing facebook promo where items that get the most likes will go on sale! Due to the popularity of the Liking Contest, Tea Collection has added more styles! Be sure to check out Tea Collection's Facebook page and vote for your favorite girl dresses and/or boys tops. Once an item has received 1,000 Facebook Likes, it will go on sale--$15 dresses and $10 boys tops! Browse the new styles today and be sure to vote for your favorite girls dresses and boys tops to ensure that those items go on sale. 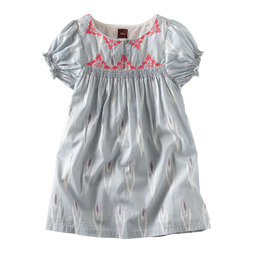 I love this Ubud Ikat Dress!